"March & Quick-step as performed by the Band ... dedicated (by permission) to Major Boydell and the Officers of the Association. Composed by W. Liquorish. London." 1801. 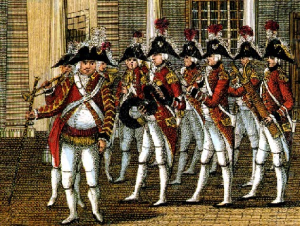 Military bands and their music proliferated during the decades when invasion by Napoleon was feared (1790 - 1810).